began as a collection of some of the research, recipes, images and culinary adventures that went into the making of Food Lover’s Guide to Portland. The first edition came out in 2010 and I started the blog in February 2009 as a companion piece to it and to help organize my thoughts while researching and writing it. The second edition came out in September 2014 from Hawthorne Books. The blog is now home to all different food, drink and beyond things I want to show and tell. I’m also co-author of Toro Bravo: Stories. Recipes. No Bull from McSweeney’s, as well as Hello! My Name is Tasty: Global Diner Favorites from Portland’s Tasty Restaurants from Sasquatch Books and Grow Your Own: Understanding, Cultivating, and Enjoying Cannabis from Tin House Books. I didn’t think I’d like blogging when I first started this but it turns out I really do mostly because I get to shout out people and things that I love. Ninth Annual Portland Fermentation Festival 2018 -- One Month Away! Ninth Annual Portland Fermentation Festival 2018 -- Two Months Away! Come out, come out wherever you are for the 4th annual Portland Fermentation Festival next Wed., Oct. 23rd at Ecotrust. We're so happy that we're less than a week away from this year's 4th annual Portland Fermentation Festival! The 2011 festival was so well attended we had a line down the stairs and around the block at Ecotrust. Last year, the thought of tackling such a popular festival was just too overwhelming for David, George and I so we decided to skip it and come back even stronger this year. We've made some changes this year so that you won't be crushed during the festival and so that you won't have to wait and hour and a half to get in. The biggest changes: advanced ticket sales, different types of tickets: two tastings and Sandor's talk (the talk is sold out -- sorry! Tickets to tastings are still available), use of the mezzanine, and rooftop food and drink sales and music by DJ Pickle Barrel. I'll let the press release speak for itself below. Please come join us for the good, stinky fun on the 23rd! Aaaand here are a few photos from our crazy 4:30am to 9am stint on KPTV's Fox News Good Day Oregon early this morning to promote the festival from 4:30am to 9am. Ouch. KPTV Fox's Good Day Oregon covers the 2013 Portland Fermentation Festival. Left to right: Jeanne Kubal of Ecotrust, Andy Carson of Good Day Oregon, Lola Milholland of Ecotrust and David Barber of Picklopolis and co-organizer of the festival. Me talking up this year's festival guest speaker Sandor Ellix Katz with Andy Carson on KPTV Fox Good Day Oregon. Picklopolis fermented foods to show off on-air along with other fermenty festival treats. 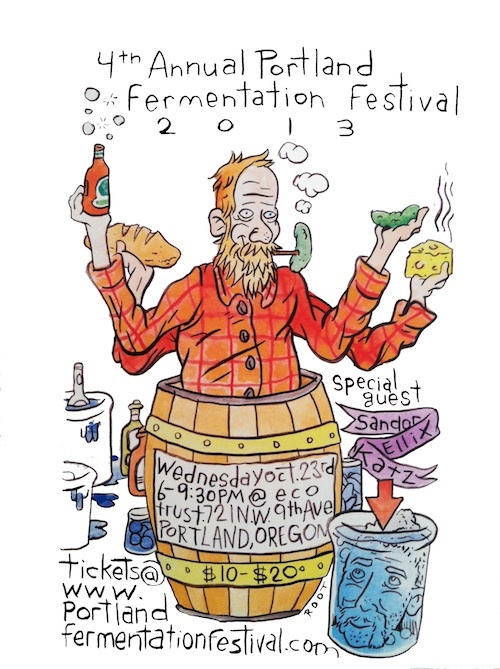 www.portlandfermentationfestival.com Twitter @PDXFermentFest Facebook Portland Fermentation FestivalPURCHASE TICKETS!